This stunning ranch estate is situated on 94 acres of picturesque rolling grasslands located an hour south of Tucson in the developing wine country of southern Arizona. The unique 4,000 square foot main house, two charming adobe guest houses with a total of four bedrooms, a three-stall barn with attached apartment, thirty acres of potential vineyards and a variety of land split possibilities offer immediate luxury along with long term development opportunities. Fenced pastures and abundant water will welcome horses, alpaca and other animals. 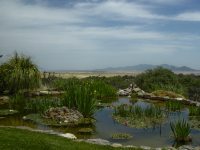 Gently rolling hills comprise 4 main pastures and 3 small pastures while scrub oaks and desert appropriate landscaping, including miniature fruit trees, surround the buildings. Approximately 30 acres have tested well for growing wine grapes. 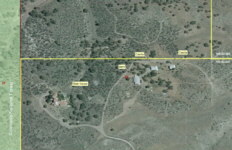 The property abuts the Coronado National Forest. The property offers a 350 foot well with a static water level at 180 feet and an estimated flow of 50-100 gallons per minute. An underground irrigation system feeds the landscaping. Water lines are placed near the acreage identified for a potential vineyard. Underground utilities serve all buildings. Commercial activities allowed on the property are agriculture or animal husbandry. Rancho San Gabriel's primary 94 acres can be split into a maximum of four equal size parcels, each allowed a main house, guest house, caretaker's house and barn. The main house elegantly combines Spanish Colonial and Arizona ranch house features while embracing green building technology. Walls are 14" thick masonry construction. Passive solar heat and cooling are backed up with conventional utilities. Custom designed tile and hardware along with hand-carved doors and cabinetry enhance the comfortable living room, intimate octagonal dining room and charming kitchen with its breakfast nook. The master bedroom spa suite caters to health and relaxation with its indoor lap pool, hot tub, mirrored exercise area and study. Additional features in the main house include a library, office, screened dining porch, darkroom, pet-grooming room, six fireplaces, 24 skylights (including 5 which open), flagstone flooring with radiant heat, an upper floor observation room with sleeping banquettes and an outdoor roof deck reinforced for dancing. The forty-eight angles around the perimeter of the house reveal inspiring views of mountains and oak-juniper woodlands throughout this gracious and creatively designed home. The main house comprises 4,009 square feet plus two car garage and was built in 1992. Built with passive solar design, the two casitas are constructed of cement stabilized adobe. Each has a beehive fireplace, kitchen cupboards made of local dried saguaro ribs, floors and countertops of polished Saltillo tile and outstanding mountain views. - Three bedroom, one bath, living room, dining area, kitchen - 1,174 square feet. Apartment is a one bedroom, one bath with living/dining/kitchen area - 571 square feet. Rancho San Gabriel enjoys the milder climate of the Mountain Empire at 5,000' elevation and is adjacent to the Coronado National forest for unlimited hiking and horseback riding. Developed over a period of nine years, Rancho San Gabriel was established by 1992 as a tranquil, inspiring, rejuvenating 'Garden of Eden' set in the beautiful Sonoita, Arizona rangelands. The unique hilltop setting chosen for the compound offers views of 14 mountain ranges and tree studded rolling grasslands. Richard G. Brittain of the University of Arizona's Department of Architecture was selected to create the architectural designs for the property. Mr. Brittain camped out on the property for many weekends prior to deciding on sites for the buildings. His specialty, desert appropriate dwellings, ensured that all the houses are optimized for sun in the winter and shade in the summer. Forty-eight angles around the perimeter of the main house capture mountain and landscape views from every window, so that the outdoors is presented as the artwork of the indoors. The two casitas and the barn with attached apartment were built first. Brittain's designs for the two cement stabilized adobe casitas serve as models for proper self sufficient dwellings anywhere in the desert. The builder for the casitas and the barn was John Ochoa of Tucson, whose craftsmanship is noticeable in the tasteful construction and details of these little houses. Living within earthen walls, gives the feeling of comfort and protection. Finally, contractor for the main house, Jerry Browning of Tucson, gets full credit for the high quality of construction. Browning's experience and skill enabled him to overcome the many complexities in the design of the main house. High ceilings and 14-inch thick double walls, soft plastered corners and arches, and radiant heat under the flagstone floors are all elements requiring meticulous care. The team who built Rancho San Gabriel have created a true work of art. The intent was to have the buildings fit in with the natural outdoor plants, trees, and views as part of the living space. State-of-the-art construction was married to an interior decor which echoes the Mexican Spanish Colonial period combined with a contemporary southwestern ranch style. Luxurious interior details such as hand-carved wooden doors and cabinetry, custom designed hardware and tiles, tasteful selection and placement of sculpture, paintings and wall adornments complete the warm ambience of this special property. Main house interior rooms include: two bedrooms, two and a half baths, indoor pool and spa, library, office, living room, dining room, kitchen, laundry room, animal room, two car garage with large storage room, and a third-floor room with bancos and an outdoor dance terrace. The home has six Count Rumford fireplaces of Spanish Colonial design. The living room, octagonal dining room, library, kitchen, and bedrooms are luxuriously enhanced by uniquely designed tiles, hardware, hand-carved doors and cabinetry. Five of the twenty-four skylights open to the stars - including one over the master bed. The house abounds with special touches and good taste which is reflected in sunlit charm. The owner designed custom original hardware for all the doors. This photo shows the diamond pattern featured in hardware and tile placement throughout the main house. Brass diamonds are superimposed over a metal alloy which resembles pewter. These door pulls are inside the hand carved mahogany front door to the main house. The pewter look is mirrored in the staircase's banister, whose posts are a bird's nest design imported from France. Lighted niches on either side of the front door display gold gilt altar pieces from an old church in Mexico. The kitchen cabinets are custom designed, made of alder wood. The horizontal stripes are made from local saguaro ribs and the handcarved medallion in the center is mahogany. This is an iron wall sconce in a fleur de lys pattern, holding a large candle. Two of these frame an archway in the living room opposite a large wood burning fireplace flanked by hand carved wooden doors. A handcarved wooden cherub is on display in the master bedroom. The main house of Rancho San Gabriel could be called "Casa de Los Angeles" because it houses a large collection of angels. Finally, a diamond pattern is echoed throughout the house in custom designed hardware as well as in the placement of colored tiles in various locations. The two casitas provide comfortable and charming private living space for family and friends. Each casita has its own beehive fireplace and complete utilities. The front patios afford outstanding mountain views. Both passive solar casitas are cement stabilized adobe structures designed perfectly for the desert environment. The owner lived in both casitas while the main ranch house was being completed and can attest to the special cozy feeling one experiences living in an adobe house. Kitchen cupboards are made of local dried saguaro ribs. Floors and kitchen countertops are of polished Saltillo tile. Carefully chosen Talavera tiles add color and accent to these warm guest facilities. Each room has an overhead fan and both houses are kept comfortable in the summer by swamp coolers. The passive solar design assures full sunlight in winter and shade in the summer. Contrasting with the soft white plaster of the casitas' interior walls is a foot of exposed adobe as a border around the walls next to the ceiling. Each casita has a stacked Maytag washer and dryer in an enclosed space near the bedrooms. Both casitas have wrap-around patios, their columns softened by climbing roses and other vines. From the one bedroom casita, you can view the horses grazing in the pasture, backed by mountain views. One bedroom casita; you may find it helpful to see the improvements map above. The main house and all out-buildings are available with 94 acres for $1,800,000. An adjacent 94 acres may also be available. Please click here to download (about 700 kb) a printable brochure in Adobe Acrobat format. If you get frustrated trying to make this work on your computer, don't hesitate to ask us to mail you a printed and bound brochure instead.